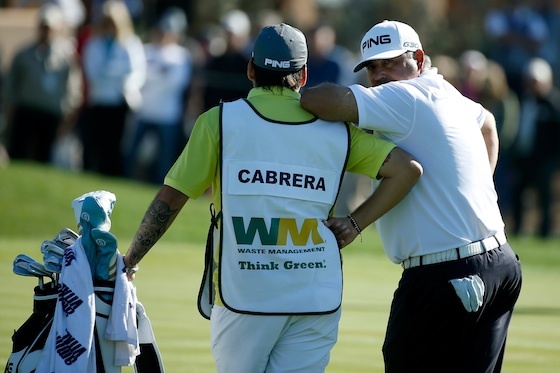 A group of professional caddies is suing the PGA Tour for requiring them to wear bibs bearing the logos of companies that pay fees to the tour but not to the caddies—and I hope they win, because it’s true, as one sportswriter said, that the tour is forcing the caddies to serve as “unpaid human billboards.” It’s a good thing they didn’t ask me to represent them in their lawsuit, though, because my own first reaction would have been “Wow! 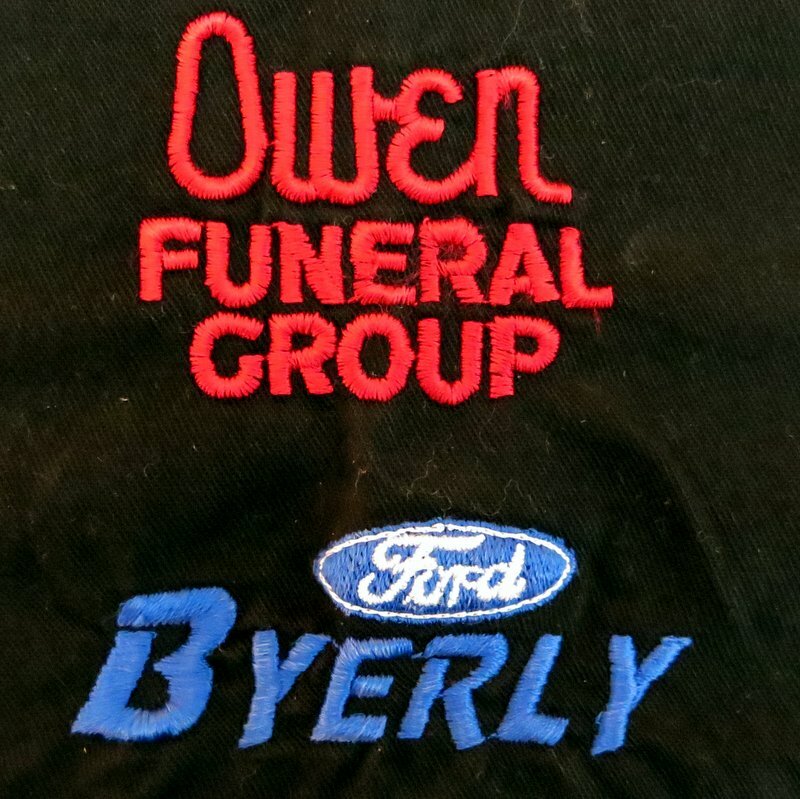 Free caddie bibs!” My friends and I not only happily wear logo-covered golf stuff that nobody pays us to wear; we even spend money of our own to add additional logos to our already-logo-covered stuff, the better to emulate Jim “5-Hour Energy-and-Web.com-plus-SunGard-Financial-among-many-other-companies” Furyk and his fellow tour members. 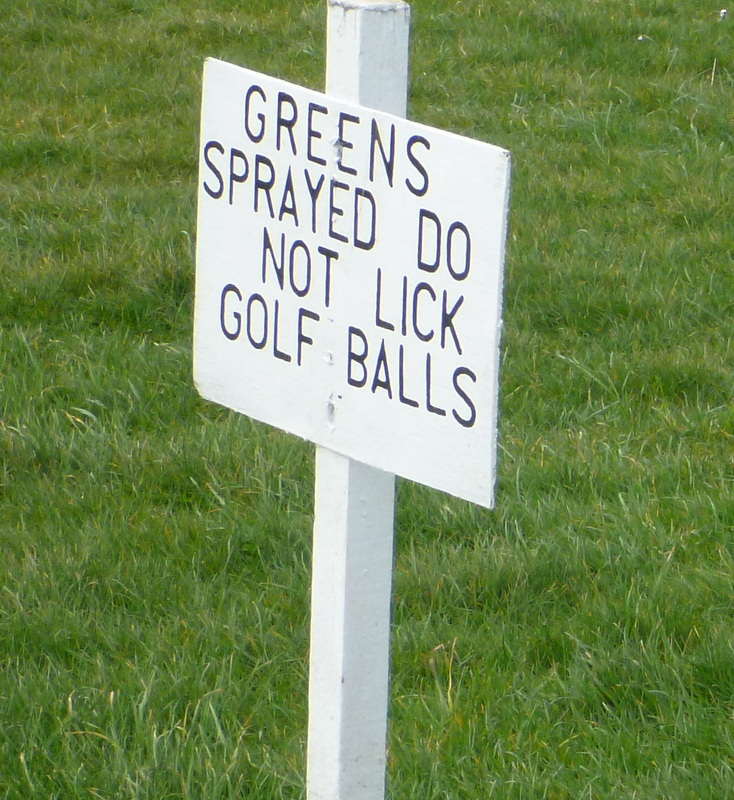 You can read more at this blog’s official home, on the Golf Digest website. And if you “subscribe” to myusualgame.com, by filling in your email address in the blank on the right side of this page, you’ll be notified every time I post something new. And, if you’re willing to wait a month or so, you can find complete versions of all my old posts on this site, too, by paging down until you reach them. Gary Levering, a lawyer and real-estate developer in Houston, died last year. 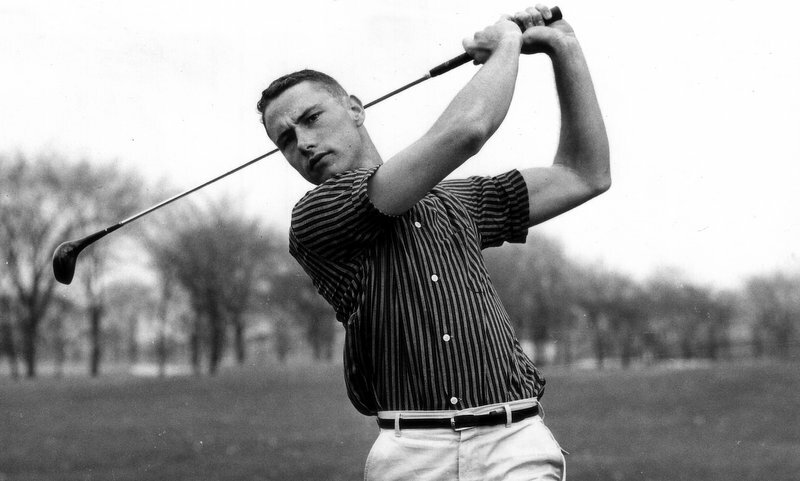 He played on the golf team at Northwestern from 1957 to 1961 (photo above, courtesy of Northwestern Athletics), and once he’d established himself in his career he reimbursed the university for his scholarship. He believed that golf was a more difficult sport than tennis. 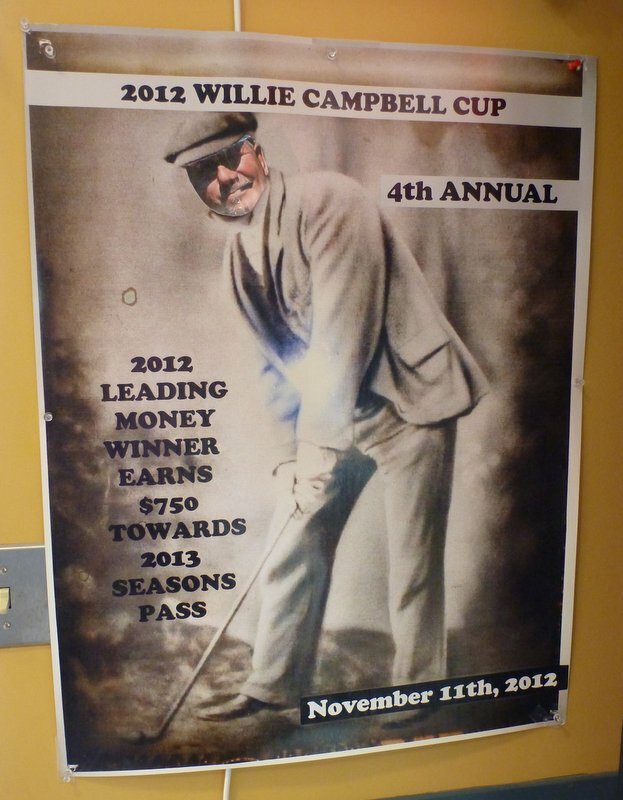 To prove it, he signed up for lessons at the Houston Racquet Club and won the club championship two years later: Q.E.D. He earned a perfect score on the test the U.S.G.A. uses to certify rules officials, and was known to friends as Dr. Golf. I learned about Levering from Keith Kimmick, a reader and a commercial-insurance executive. He heard Levering give a talk about bipolar disorder, from which he suffered, at River Oaks Country Club, and when the talk was over Kimmick asked what he could do to help. Kimmick and Reese shared a love for Cypress memorabilia. Kimmick’s collection is extensive, and he has shown me images of some of his favorite items. I’m going to write about one of them in a future post. 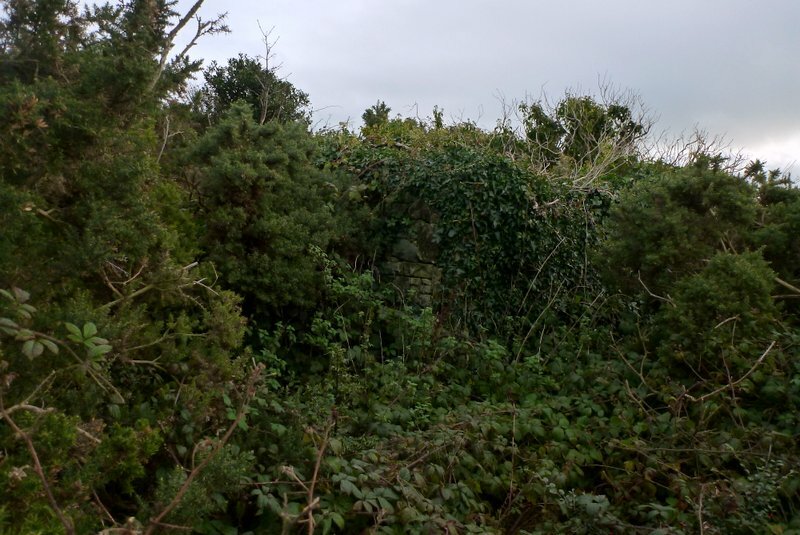 (Not the photo below, which is part of my own Cypress collection. 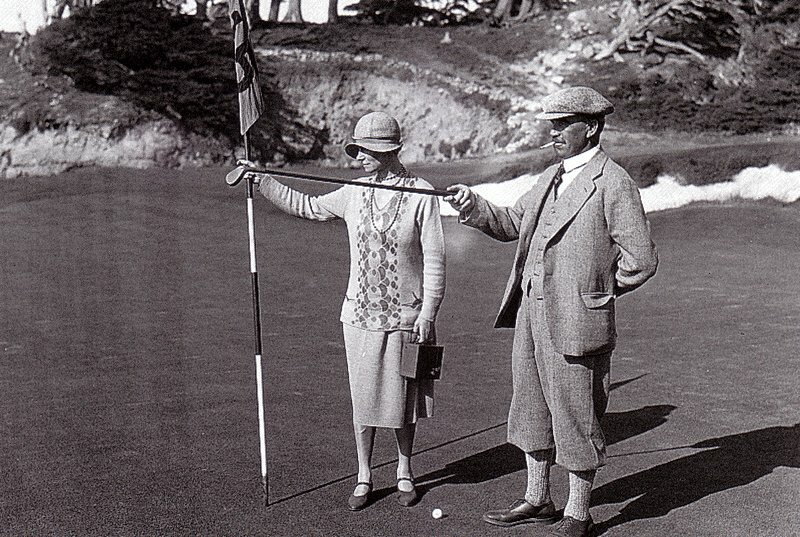 It’s of Alister MacKenzie and his wife, Hilda, on the fifteenth green when the course was new. That box in Hilda’s hand is a camera—and check out her shoes. On the seventh green, as we were trying unsuccessfully to mark our balls, one of the caddies said, “Whatever you do, do not get within 10 feet of that cliff.” No. 9 at Bandon is a straightforward par 5. On a normal day, it’s two good shots and a little pitch, and then you’re putting for birdie. Playing dead into he storm, I hit driver (hard), 3-wood, 3-wood (again), and then a torched 8-iron to the front fringe, 50 feet from the hole. I’m more pleased with that result than hitting it in two on a normal day. At the end of nine holes, much to the relief of our caddies, we suspended play for a burger and a beer, and strategized about how best to complete the matches. 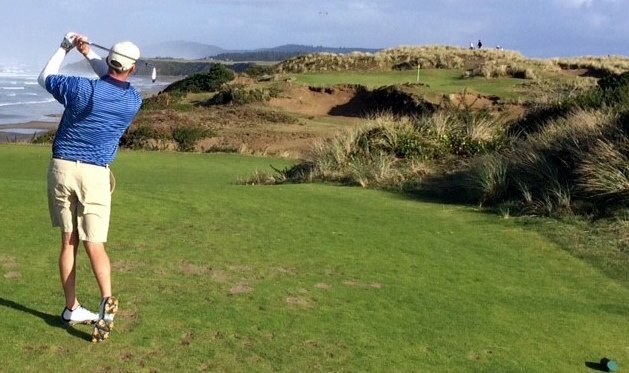 We settled on the Preserve, Bandon’s new 13-hole par-3 course. 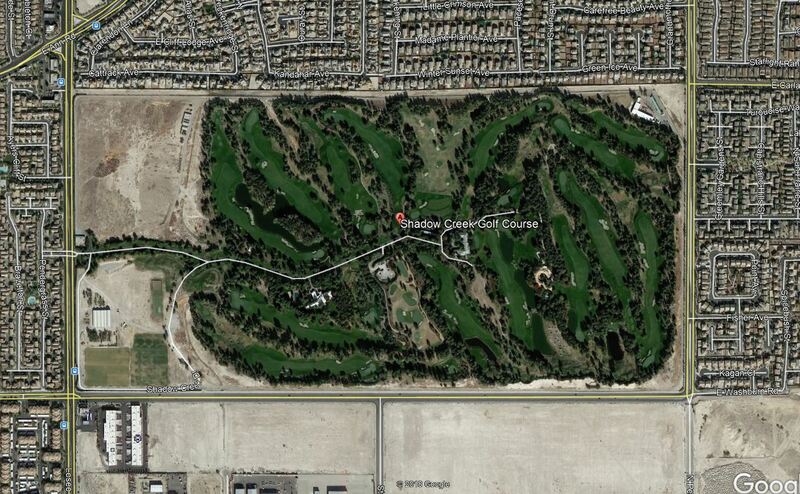 The longest hole is only about 160 yards, but many holes turned out to be unreachable. 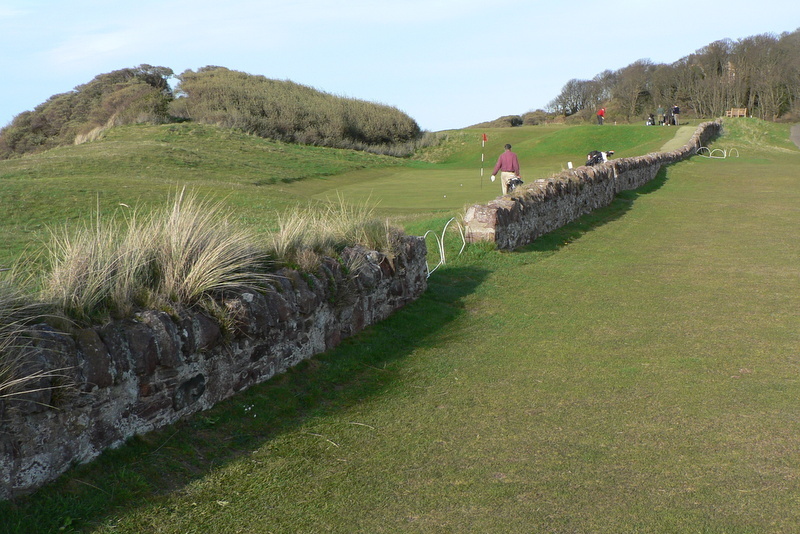 On others, you’d hit a simple pitch shot and watch the wind whisk your ball over the green and into the gorse. 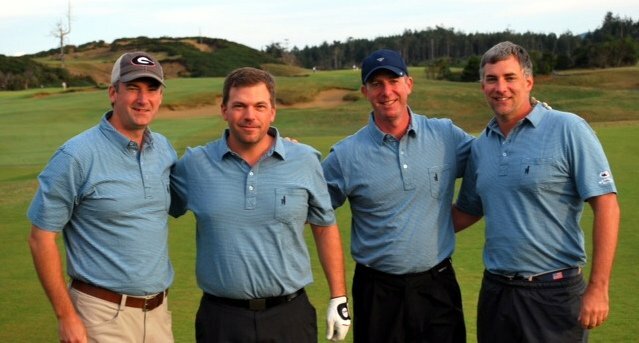 At the end of the day, we were tattered, wind-damaged, and in possession of a golf experience we’ll all remember for a lifetime. Here’s the winning team. 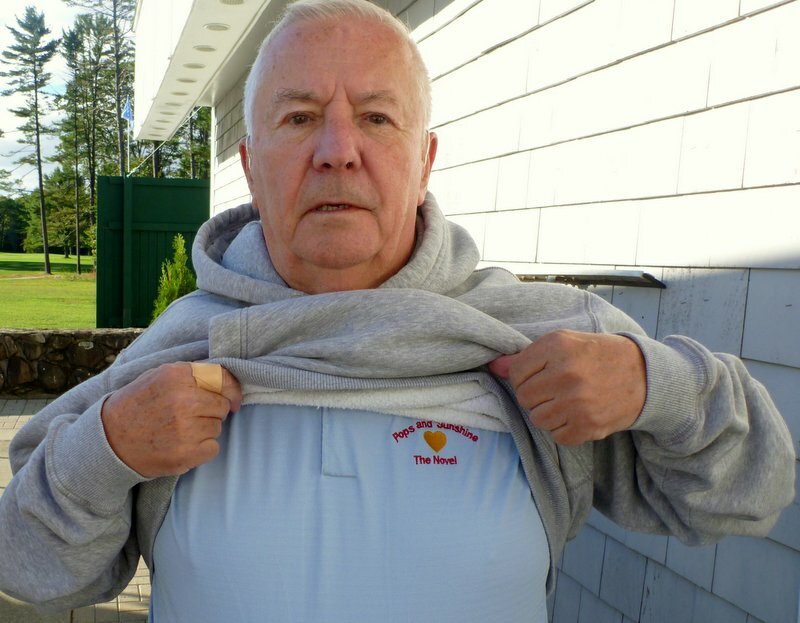 (Marty Hackel: note the wardrobe.) From left to right, they are Mike Kemmet, Trevor Dyer, Mike Goldman, and Steve Harry. Dyer (a.k.a. The Captain) organized the trip, and kept everyone up to date with a website he created for that purpose —an excellent idea. During that trip, a starter told me that, several winters before, on a day when the wind blew hard and Bandon received almost seven inches of rain, all eighty-five golfers on the tee sheet played—and so did two walk-ons, who were passing through and thought the day looked reasonable for golf. They were right! 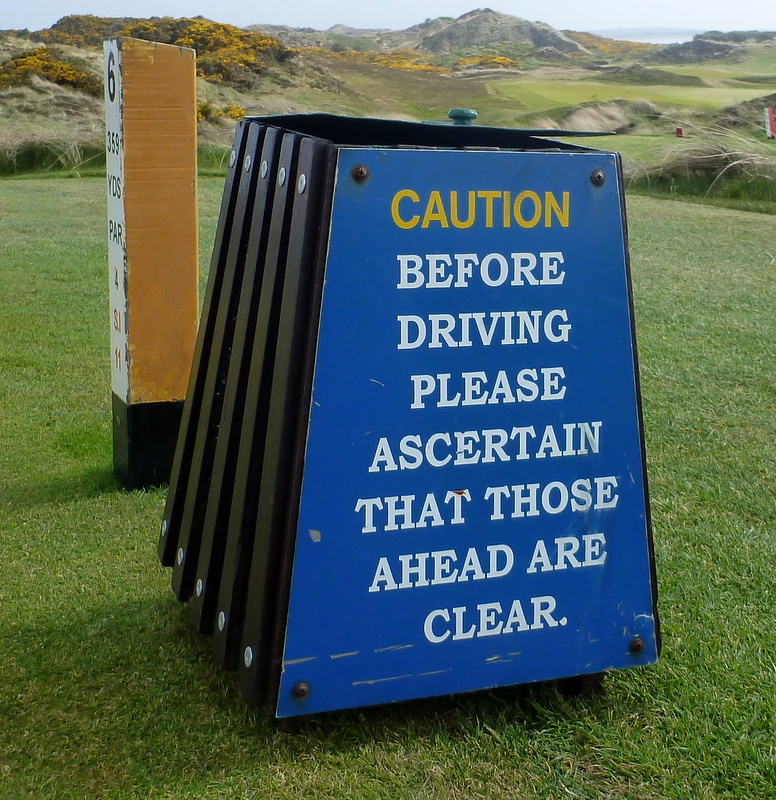 Royal County Down, Newcastle, Northern Ireland, November 11, 2013. 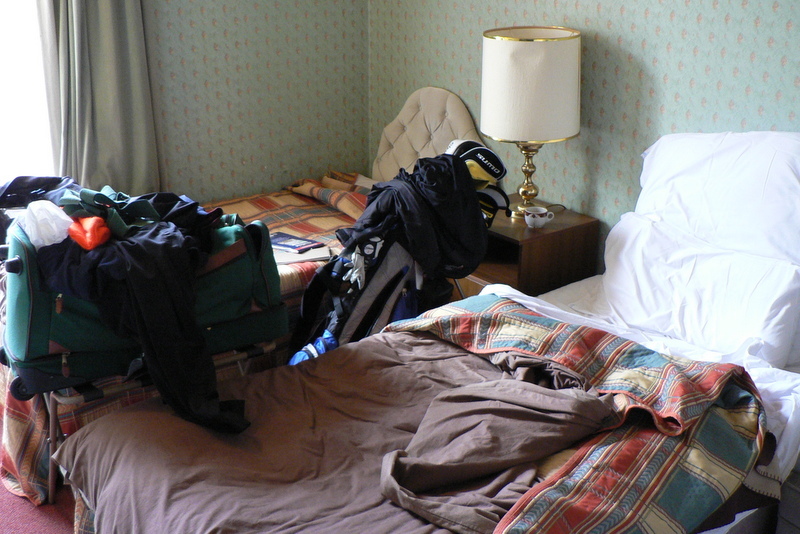 The caddie’s theory was that the structure had been the house of the original greenkeeper, but Harry McCaw—a past captain of both Royal County Down and the Royal & Ancient Golf Club of St. Andrews—told me this past November that he thought it might once have served as the literal “club house”: the place where early players stored their clubs. When he said this, we were standing in the current R.C.D. clubhouse in front of a glass case that contained, among other mementos, the red coat that was McCaw’s official uniform during his captaincy of the R. & A. 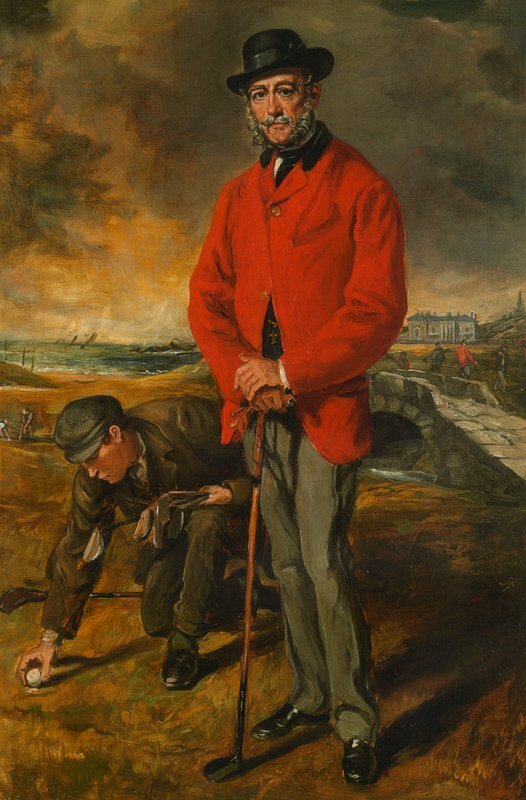 A past R. & A. captain (not McCaw), playing the Old Course. That’s the R. & A. clubhouse in the background. Four miles, as the golf ball flies. 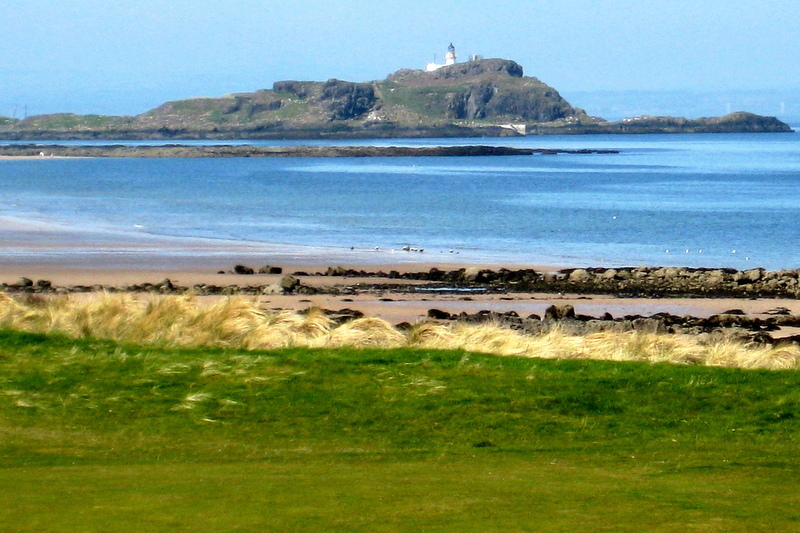 Thirteenth green, North Berwick Golf Club, Scotland, May, 2008. I missed the gap, and then l was really in trouble. During two of my most recent visits to North Berwick, I stayed in a small hotel overlooking the course, called Blenheim House. Sad to say, the young couple who owned it, Milton and Ailsa, gave up last year and sold it to someone else. I don’t know if it’s back in business. R.I.P. 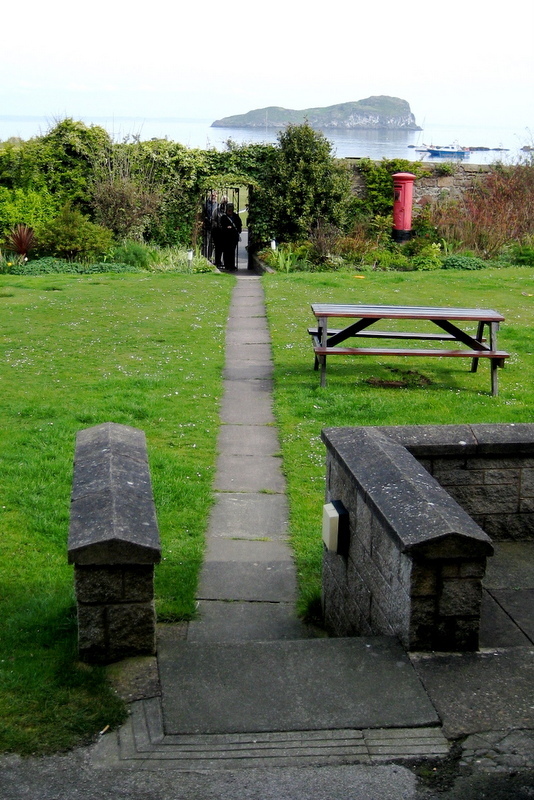 : Blenheim House Hotel, North Berwick, May, 2008. On the fourteenth hole, the old man and I caught up to and joined three Swedes. He knew them already, because he had run into them the night before, in the bar at the Blenheim. They were part of a group of six, and they had played Muirfield the previous day, and they were going home in the morning. One of them said that the flight from Edinburgh to Stockholm was just an hour, and that he would be going straight from the airport to his office—a thought that made everyone temporarily adopt a grim facial expression. 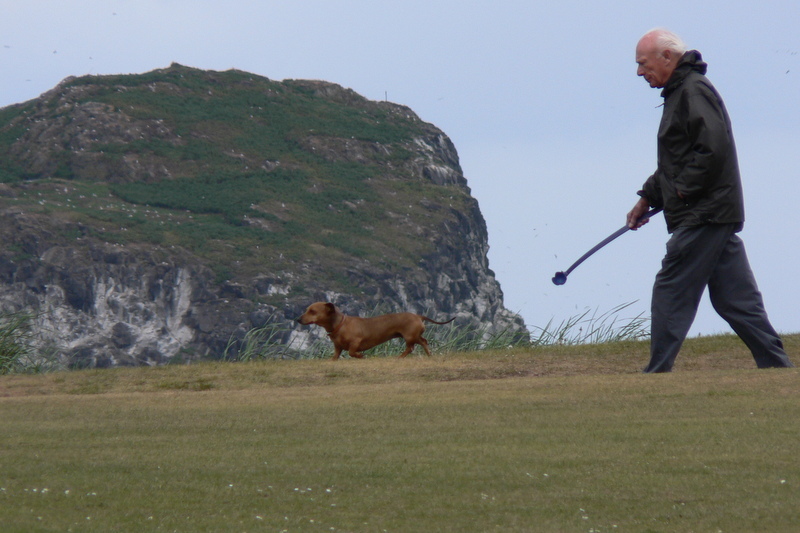 The old man walked along with us until he got back to his gate. It turned out that he was very interested in Swedish girls, and other girls. 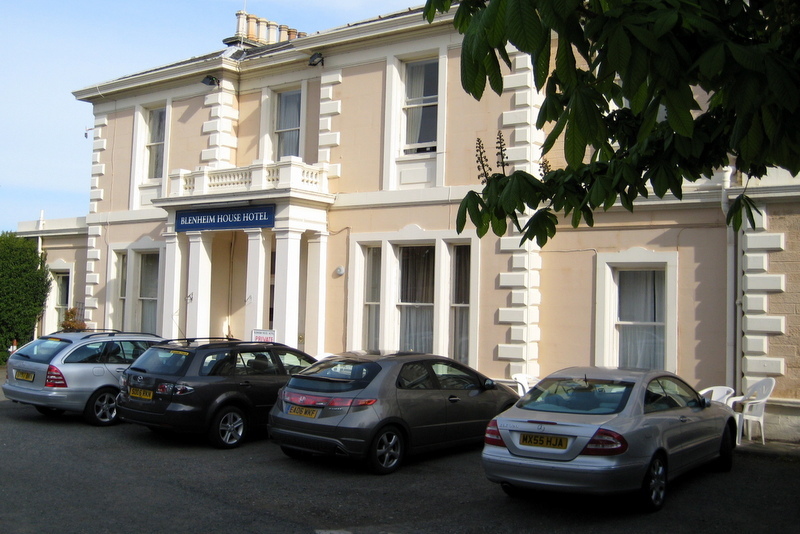 That night, I stayed not at Blenheim House but at the Mallard Hotel, in Gullane. Incidentally, “Berwick” is pronounced BARE-ick, and “Gullane” us pronounced GILL-en. 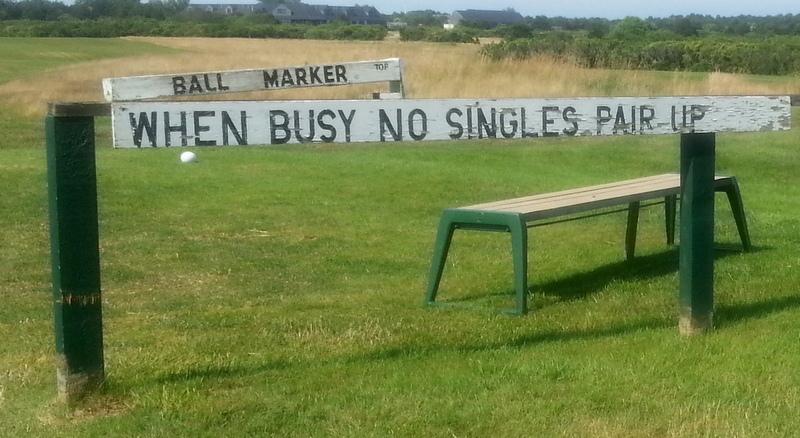 There are three golf courses in Gullane: No. 1, No. 2, and No. 3. 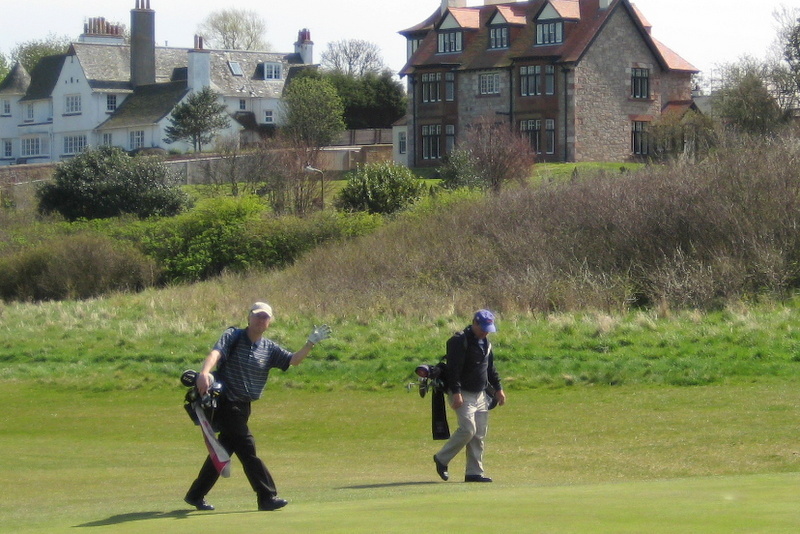 Muirfield Golf Club is virtually next door and can be seen from the top of Gullane Hill, and a caddie at Gullane once described it to me as Gullane No. 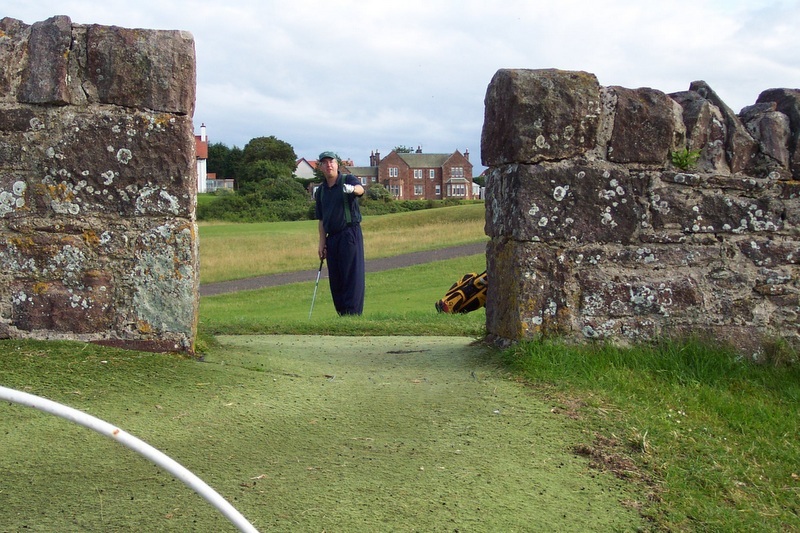 4—although Muirfield members don’t think of themselves that way. I ate dinner that night at a pub called the Old Clubhouse. 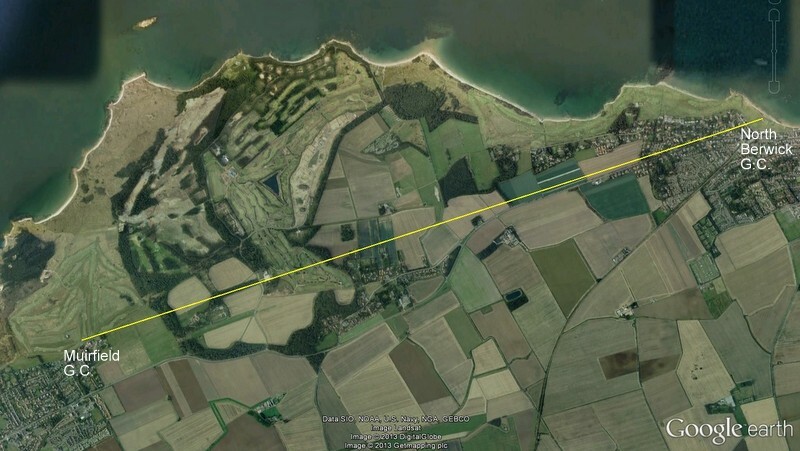 Directly across the street from both the pub and my hotel was the Gullane Golf Club’s six-hole children’s course, which costs nothing to play, as long as you’re not an adult. As I walked to dinner, I saw a man and his nine- or ten-year-old daughter. He was teeing up balls for her, and she was hitting the most gorgeous draws with a driver. She was hitting from a tee toward a green, but she was using the hole as a driving range. What a swing! And beyond the children’s course I could see Gullane No. 1 and No. 2. First green, Gullane No. 1, looking back toward town. 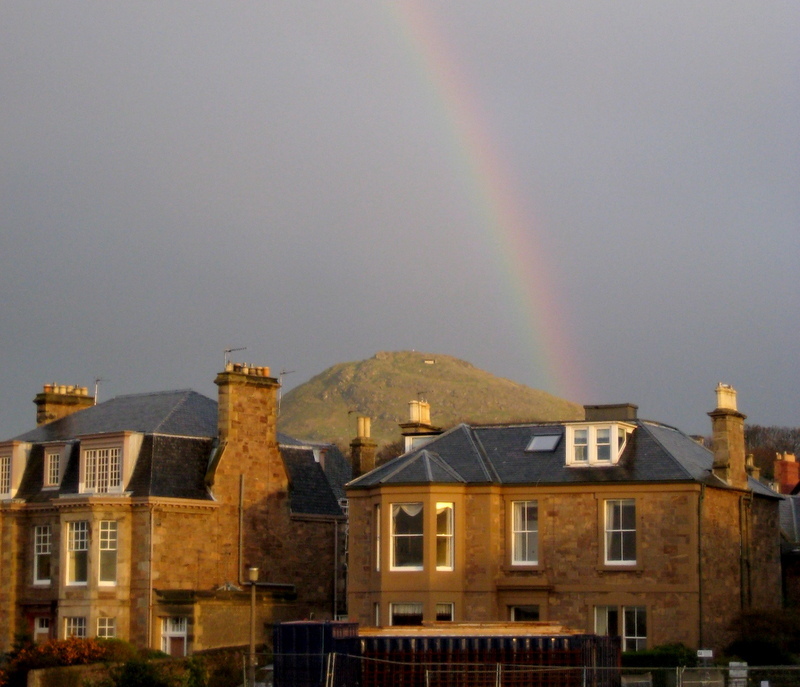 The knobby thing at top right overlooks North Berwick and is also visible in the photo with the rainbow, below. I almost feel picking a fight with my wife, to see if I can’t tempt her to give me the boot. 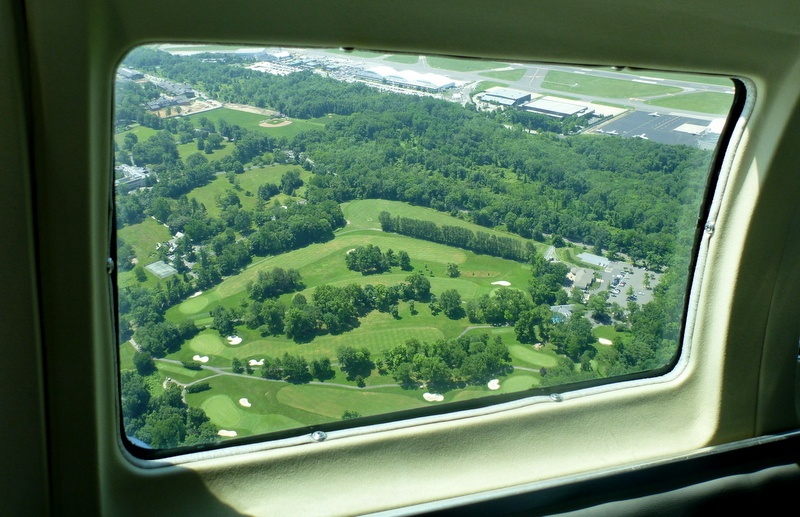 Bruce Memorial Golf Course and Westchester County Airport, July 8, 2013. My wife and I flew to Nantucket earlier this week. In the air, we felt kind of rich, because we were the only passengers on the flight, but also kind of poor, because the plane was just a crappy Cape Air twin-engine Cessna eight-seater. 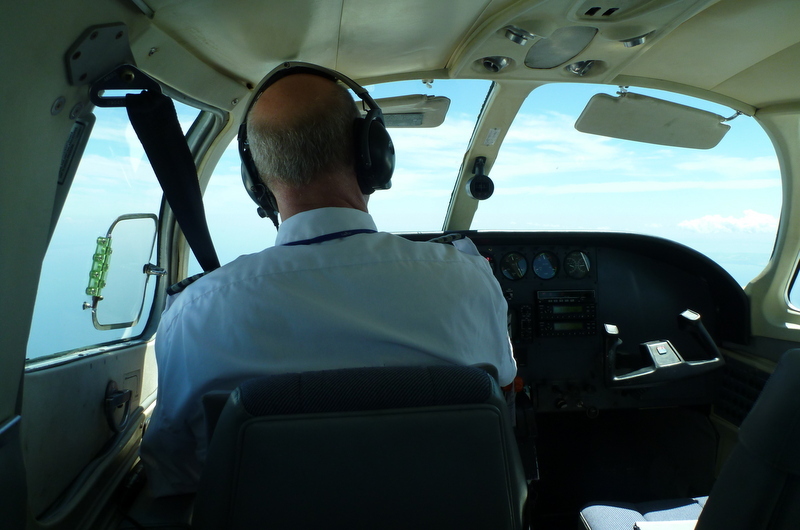 I’d flown Cape Air before, on trips to and from Martha’s Vineyard, where my wife and I have spent summer vacations for many years. The weather during those flights was almost always terrible, and I spent most of each one gripping my seat and thinking, “We’re almost certainly going to die, but, if we don’t, this sure is faster than taking the ferry.” The weather this time was perfect, and from the plane I saw lots of golf courses, including the one in the photo above, a public course in Greenwich, Connecticut, right next to the airport. It was almost like visiting Google Earth! This was our pilot. He never asked me to take the controls, but I studied them, just in case, when I wasn’t scanning the ground for golf courses. When we got to Nantucket, my wife took a nap, and Bob G.—an honorary member of the Sunday Morning Group, who had made our trip possible by arranging for me to give a talk in a local lecture series—took me on a tour of the island. Because our wives weren’t with us, our tour consisted solely of golf courses. Old Sconset—the first stop on our tour—is known locally as Skinner’s, because Skinner was the middle name of one of the people who owned it for a while. 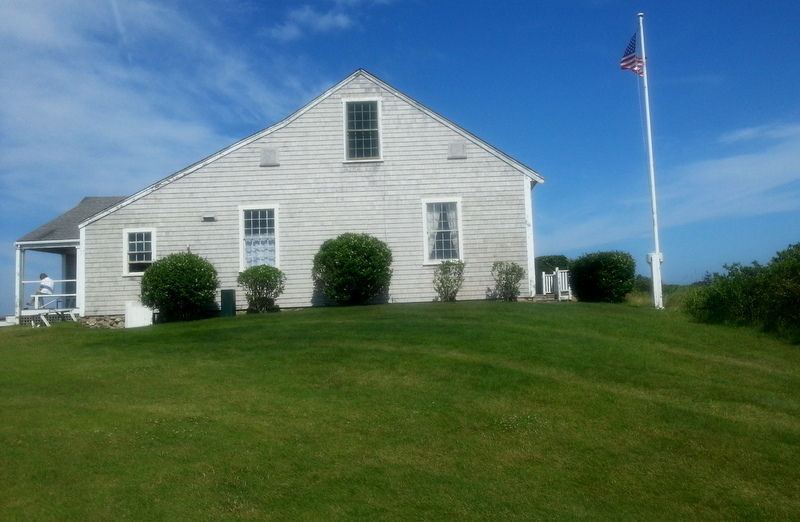 (It’s now owned by the Nantucket Islands Land Bank.) 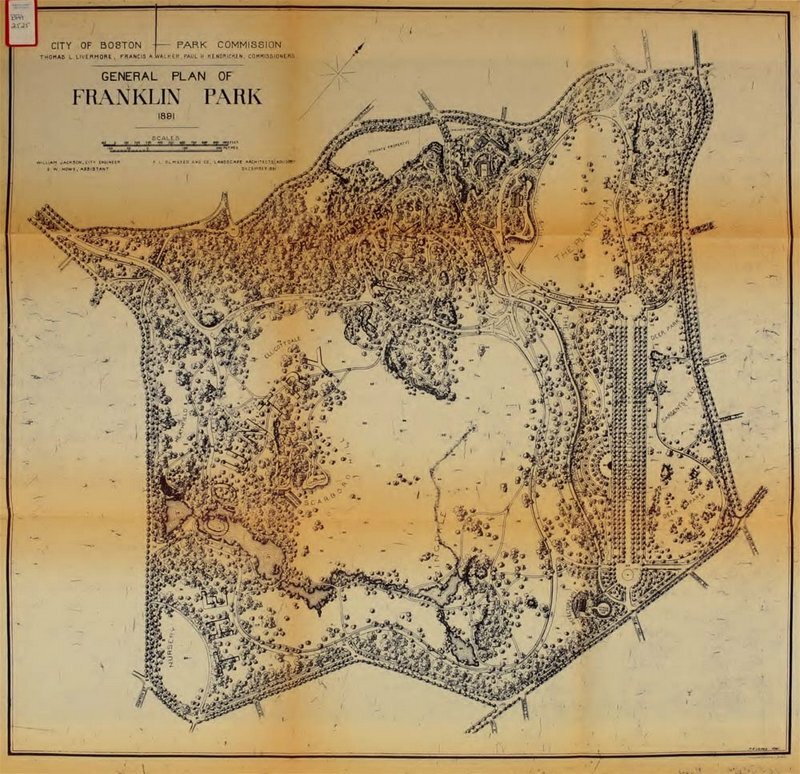 You can read about the history of the course here. 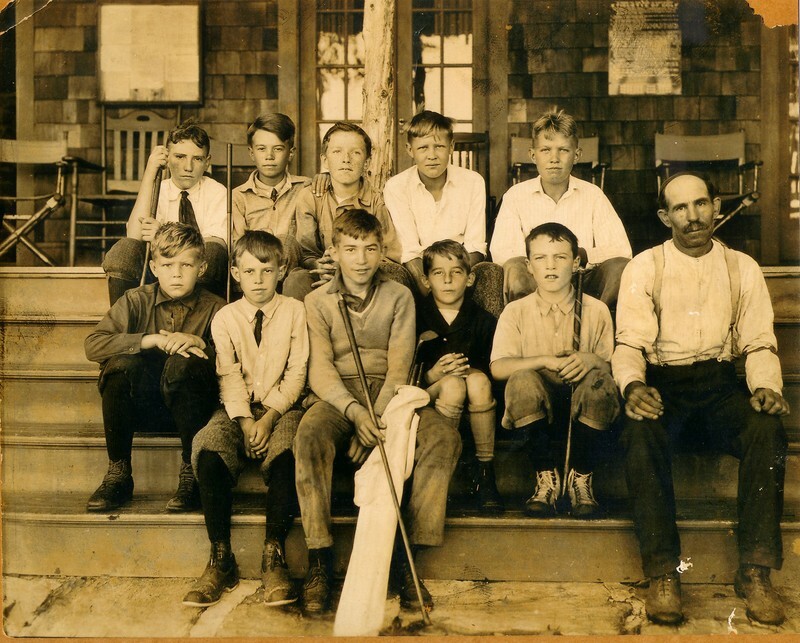 Inside the clubhouse, Old Sconset Golf Course. 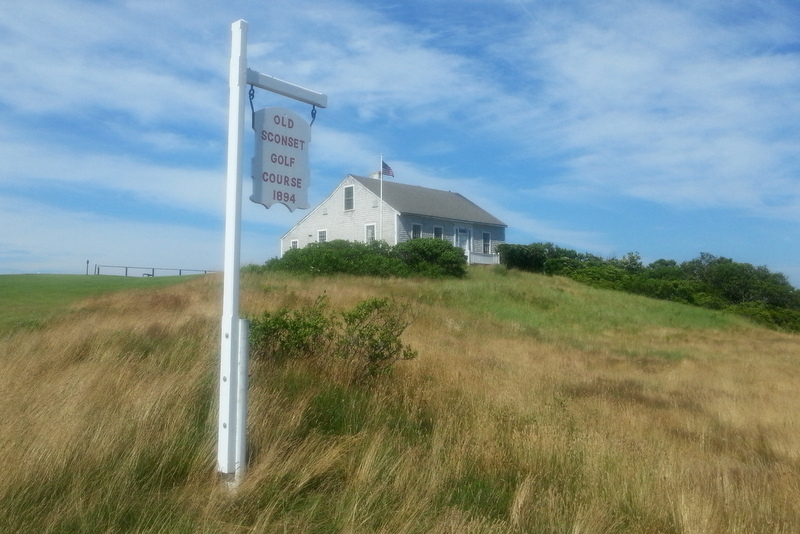 The next day, Bob and I actually played golf, at Sankaty Head Golf Club, a course that’s been on my to-play list for a long time. 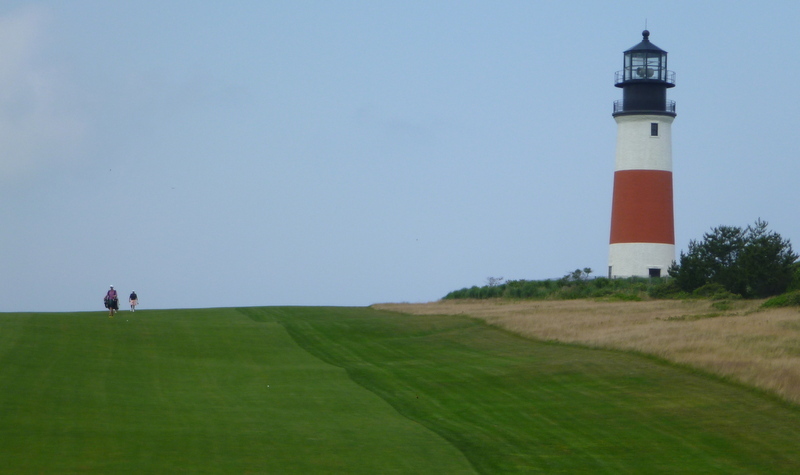 Sankaty Head lighthouse, which recently had to be moved farther from the cruel, cruel sea, and the somewhat less cruel fifth fairway. 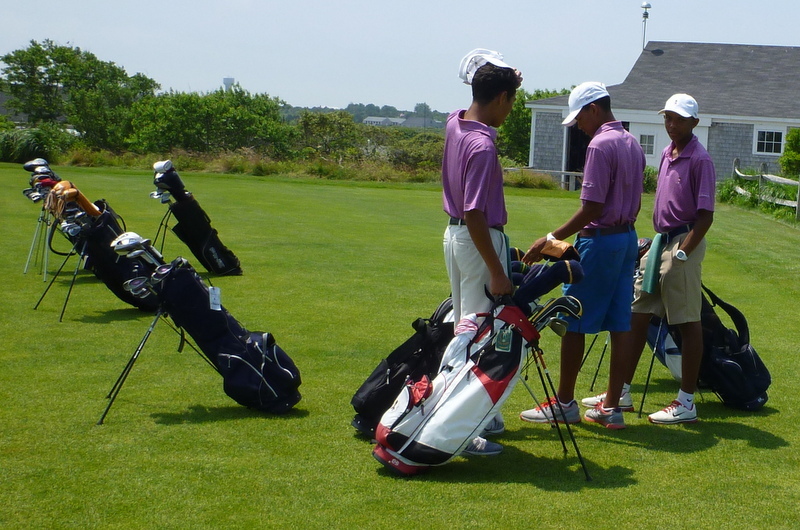 Maybe the very best thing about Sankaty is its caddie camp. 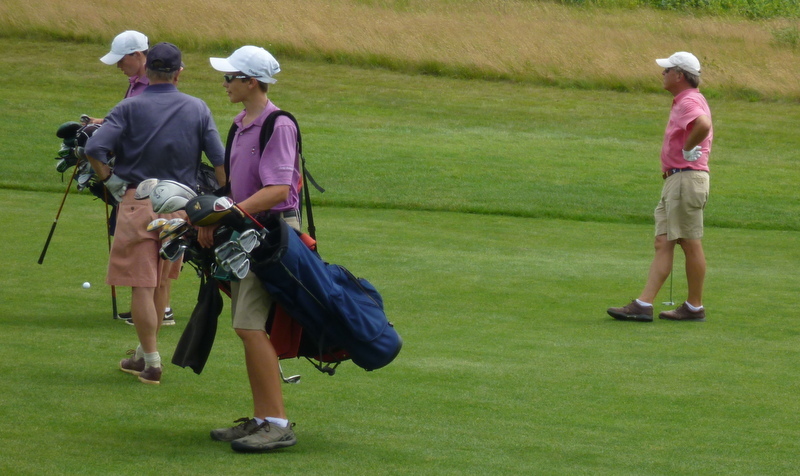 Every summer, sixty boys spend two months living at the club and caddying for members. 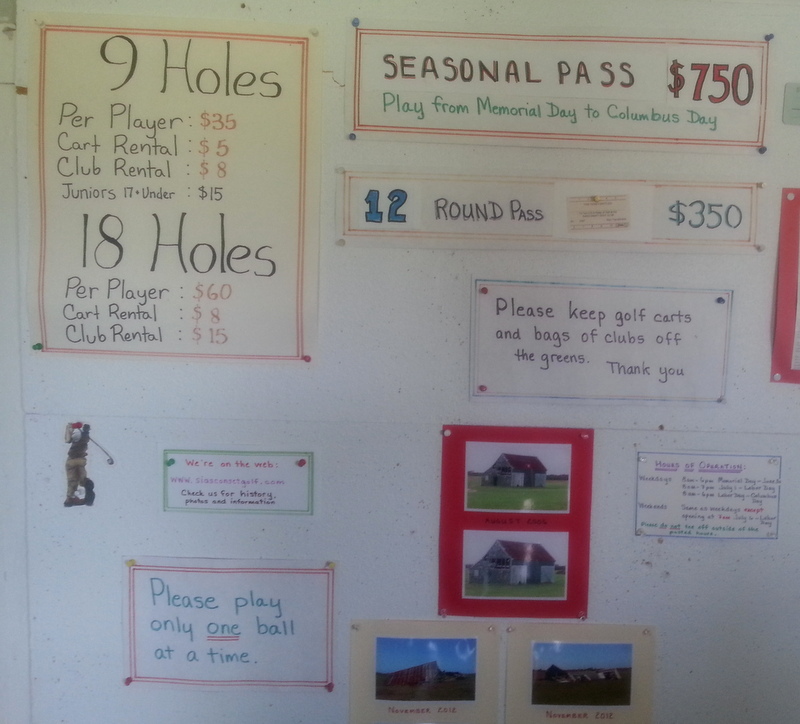 They have their own bunkhouses and dining hall, and there are organized games, trips into town, and other activities, in addition to lots of after-hours golf. Tom, Bob G., Charlie, and Peter. The caddies get Garmin G.P.S. watches, hats with their name on them, and other stuff, and they make good money. Also, they are so polite that they make you almost reluctant to use bad words in their presence. 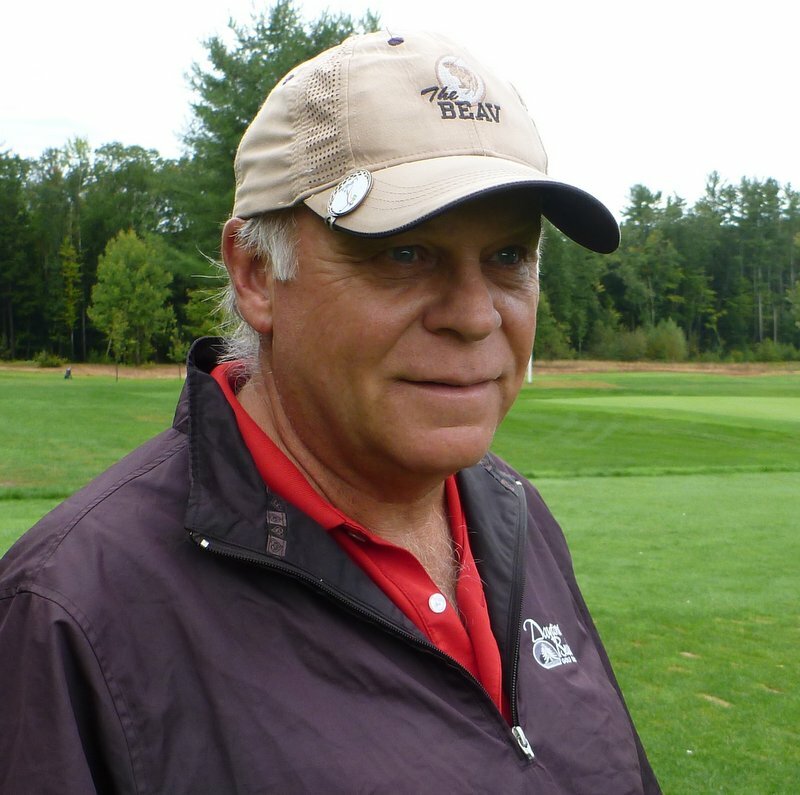 The next day, Bob and I played golf at Miacomet Golf Course, which, like Skinner’s, is public and is owned by the Land Bank. 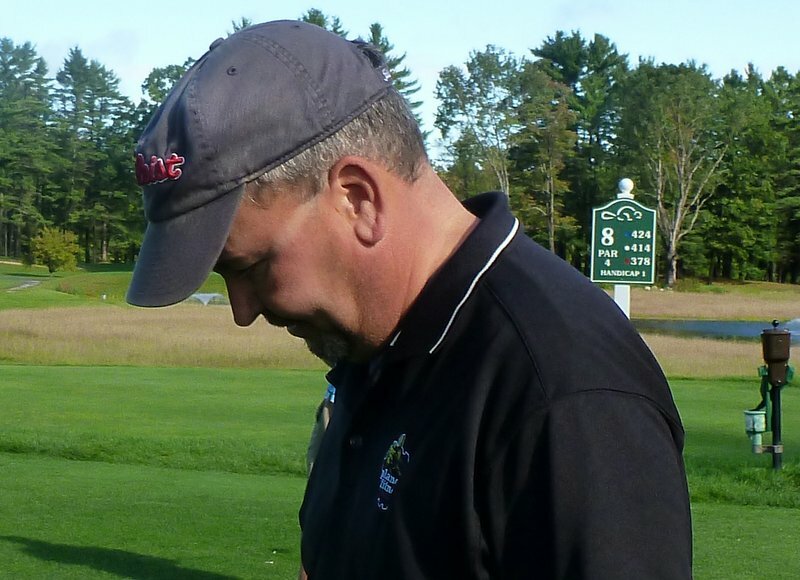 We played with Phil Truono, the director of golf. 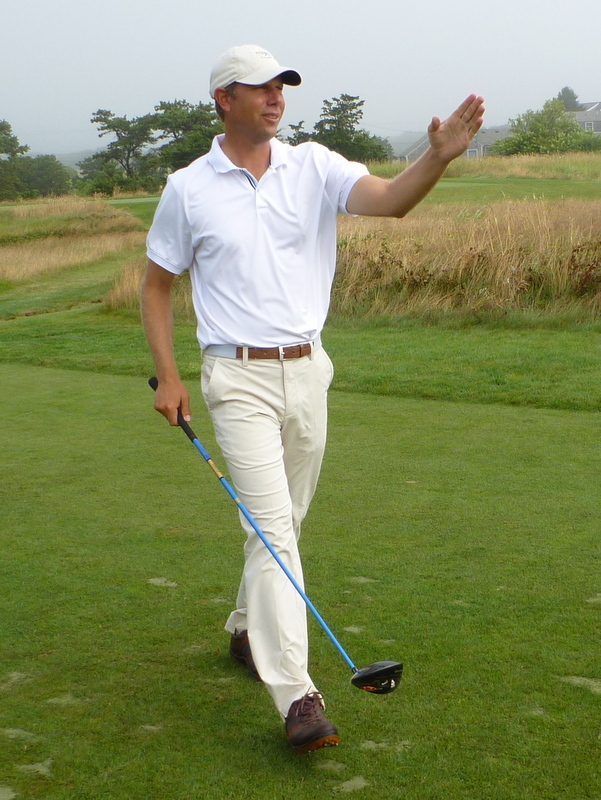 Phil Truono, Miacomet Golf Course, Nantucket, July 10, 2013. Famous building, Will, Brent, D.O., Ben, famous statue. Fourteenth tee, Liberty National Golf Course, Jersey City, New Jersey, May 5, 2013. On Sunday, I had the tremendous good fortune to be invited to join a twelve-man outing at Liberty National Golf Course, in Jersey City, New Jersey, directly across the Hudson River from lower Manhattan. 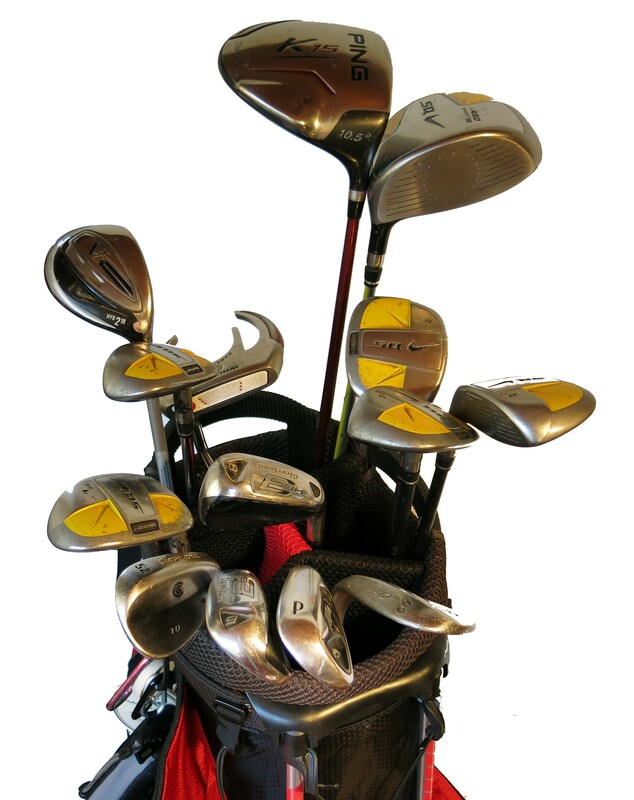 I employed a labor-saving technique I’ve often used during visits to other rich-guy golf clubs: I wore my sorriest-looking pair of shoes, knowing that the locker-room guy would fully resuscitate them while we were playing. During a multi-day trip Pine Valley ten or fifteen years ago, I took three sorry-looking pairs of shoes and left them outside my door sequentially. I went home feeling like a new man. Cool clubhouse–and that statue again. Liberty National was designed by Tom Kite and Bob Cupp, and it was built, in 2006, on a desolate industrial site. (I’ve seen a variety of cost estimates, all of which have nine digits.) 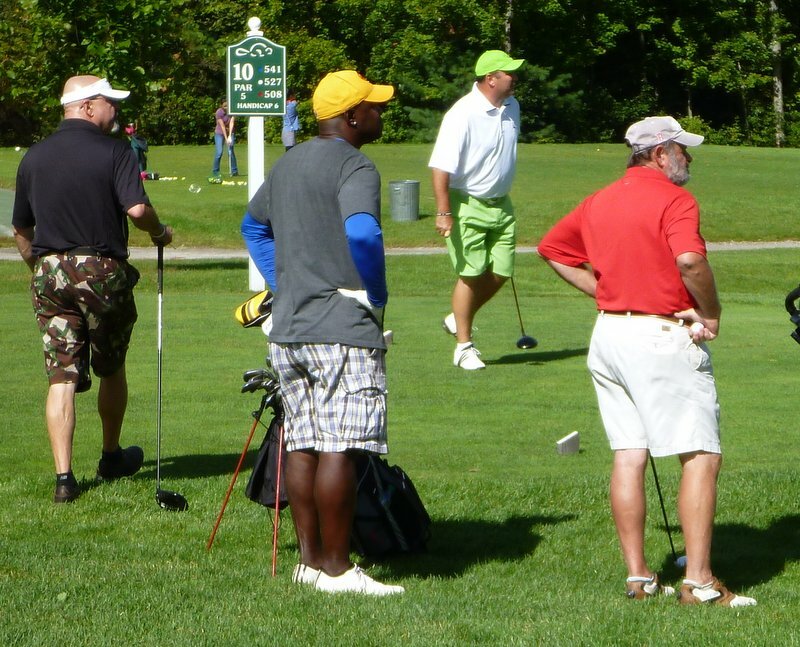 The Barclays—which used to be known as the Westchester Classic, and then as the Buick Classic—was held there in 2009, and it will be held there again in August. Tour players grumbled about the course the first time. 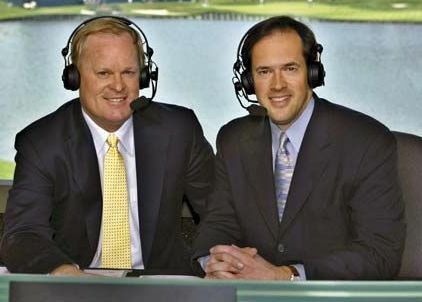 Since then, Kite and Cupp have made many changes, and either the changes have been effective or I don’t know what I’m talking about, because I liked the course a lot. And the clubhouse is the only starkly modernistical one I’ve ever been in that I fully approve of. 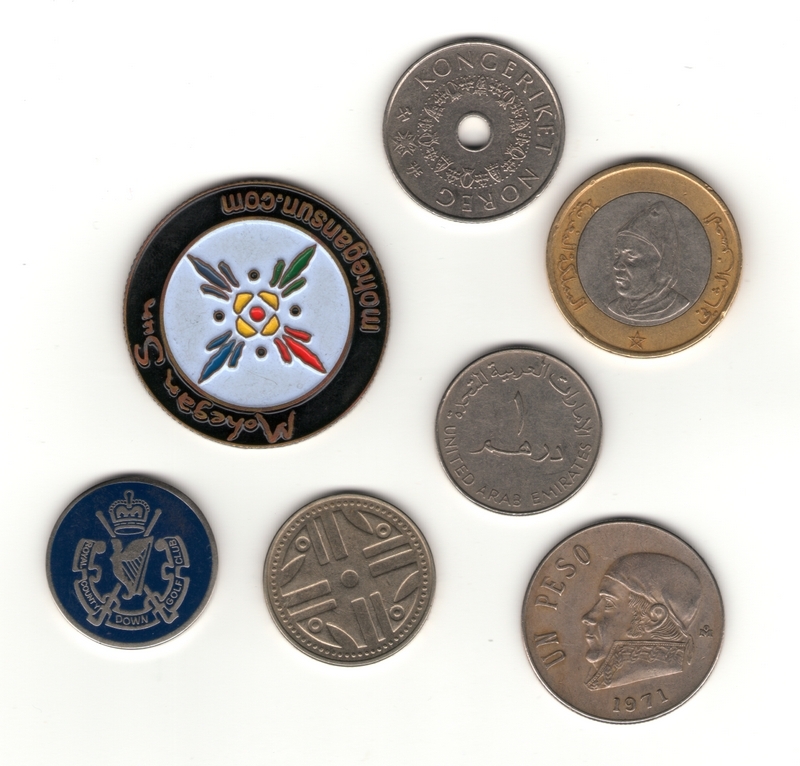 When I wrote about (a slightly different selection of) lucky ball markers, last year, I said that when I used a coin with a guy’s head on it I aimed the top the head at the hole. 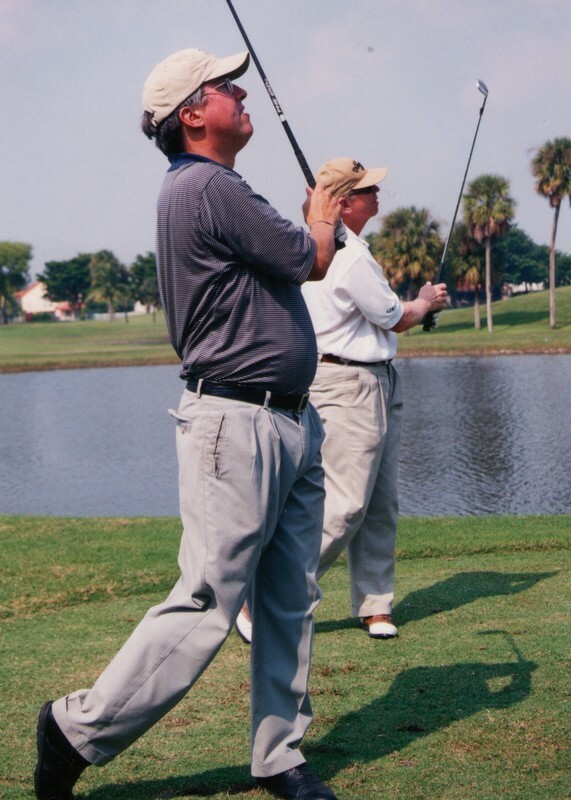 Michael Clark, a reader, wrote to say that, on the final day of a three-day-tournament at his club, he had discovered a better way. “The eyes of the coin had to be looking at the hole,” he wrote. 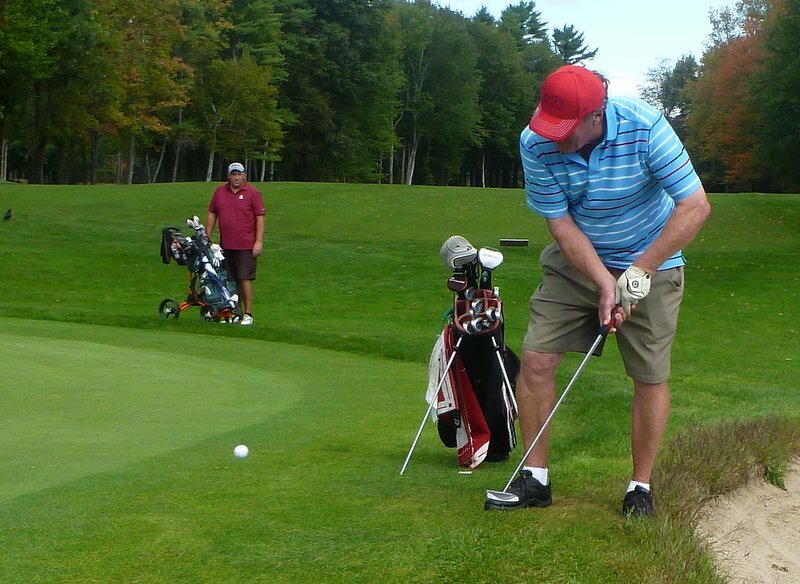 “When the eyes lined up to the hole the putts were dropping! Also, it had to be the same coin. So, if the coin has eyes, line them up!” Since then, I have field-tested Clark’s method, and adopted it. The photo above is of what is probably the luckiest green-repair tool I’ve ever owned. 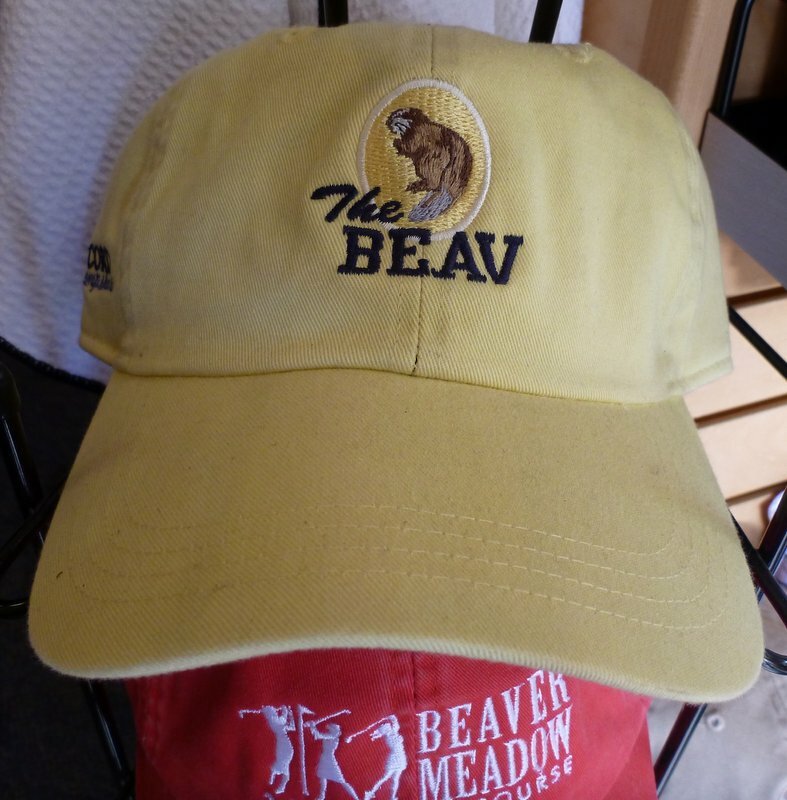 I got it at a super-secretive golf club called Morefar Back O’ Beyond, which straddles the border between Danbury, Connecticut, and Brewster, New York. 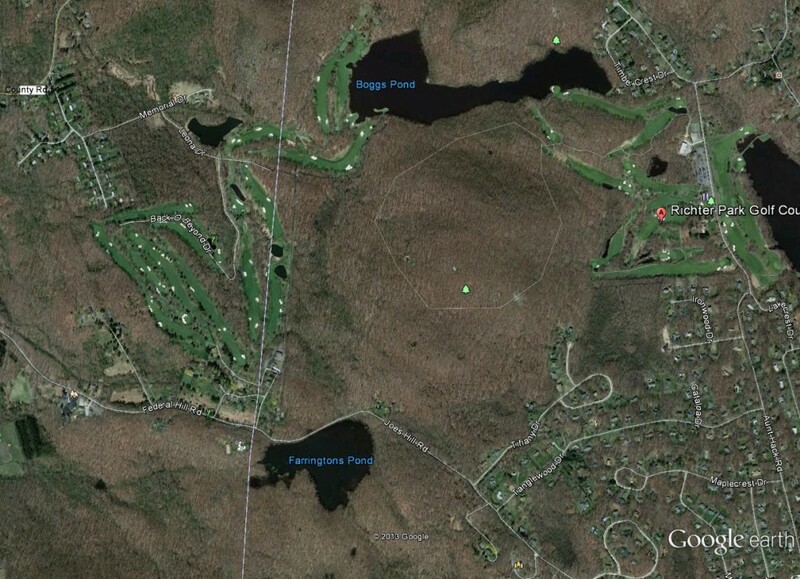 The course on the left is Morefar. The course on the right is Richter Park, which is owned by the city of Danbury, Connecticut, and is one of the best munys in the country. 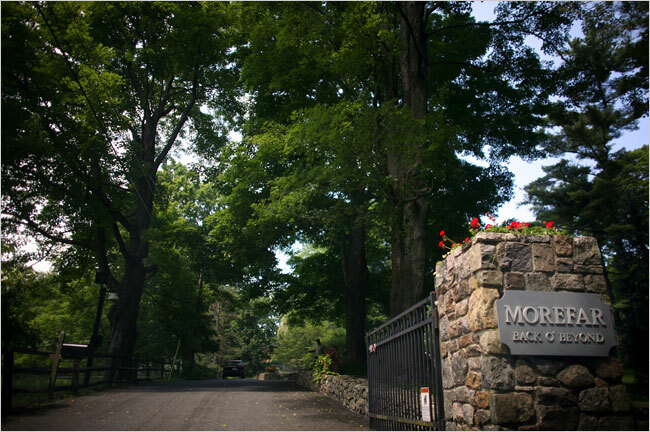 Morefar used to be owned by the disgraced insurance company A.I.G. 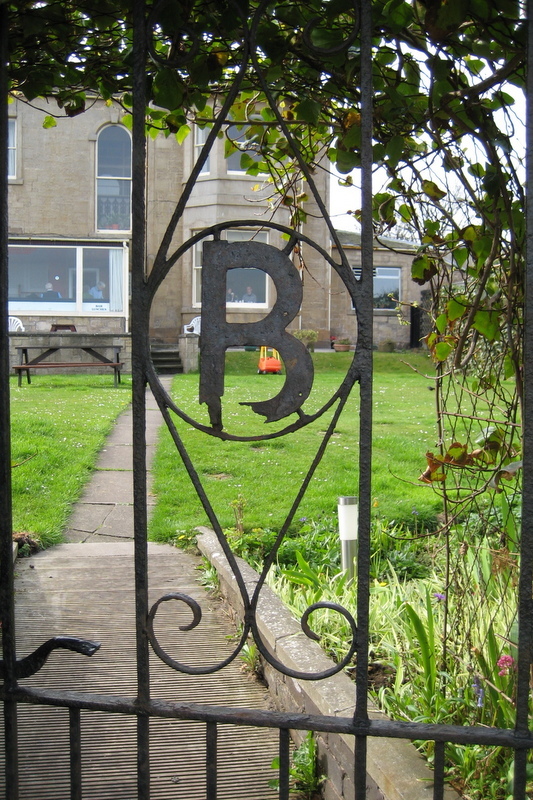 I played there a dozen years ago as the guest of one of the club’s handful of local members. Only a tiny number of golfers are allowed out each day, and the only other group on the course on the day we were there was that of the Sultan of Brunei, who teed off before we did. He and his retinue were almost comically slow, but, it turns out, you don’t play through the Sultan of Brunei. On an airplane recently, I saw a guy (in first class) who had a Morefar attaché case in his lap. I gave him the secret sign of brotherhood (by showing him my green-repair tool) as I walked past him on my way to the back of the plane, but he cut me dead. Several readers have sent me descriptions of what’s in their own bag. As promised, I will soon create a new section and post several of them permanently. If you’d like to add your own bag to the pile, send an email to myusualgame@gmail.com. Include a golf-related description of yourself and at least one or two photos of your golf stuff.